I kept a log of all the games I managed to play during the calendar year of 2016. I played some a little. I played others a lot. Here are some brief notes about each. I played most of these games via Steam, often on Windows but sometimes on Linux. There are a few Android games in here; I’m not very fond of mobile gaming. Also, there are a few Xbox (original) games mixed in as well since I had a brief period of trying out a bunch of random Xbox games I have laying around using one of the old Xbox consoles I have accumulated. XCOM: I started off the year with something familiar. At the start of the year, this was the most-played game in my Steam library (at around 100 hours). Double Dragon Neon: I was an expert at Double Dragon 1, 2, and 3 on the original NES. I really enjoy this game since it’s a love letter not only to the original series but also to 1980s kitsch with the camp level turned up to 11. It’s especially a joy to listen to. Every power-up has an accompanying theme song which is a pastiche of some popular song from the 1980s. However, I’m not as good at action games as I used to be. So I can’t get very far in this game. Westerado: Double Barreled: Novel little pixel-art Western-themed adventure game from Adult Swim. I haven’t gotten too far on this, but I would like to get back to it sometime. Tembo The Badass Elephant: Crazy action game where you play a mean, rampaging elephant. Another game that highlights how poor I am at action games these days. WarCraft III: Reign of Chaos: I liked playing StarCraft II and so I wanted to try some earlier Blizzard RTS games. I had procured the WarCraft III Battle Chest bundle quite some time ago but I could never make it work right on Windows 7 installations (the FMV wouldn’t play which left me a bit confused). But since I built a proper Windows XP system this past year, I got to try this game after all. So far, it has left me a bit bored. Ultra Street Fighter IV: It seems that I often kick off a Steam gaming session by playing a few matches with the 50+ fighters in this game. As many times as I have played this, I haven’t racked up a lot of hours since I just can’t take too much of it in one sitting. GemCraft – Chasing Shadows: A tower defense game that apparently started life as a web browser game. Despite my love of TD games, I haven’t gotten too far into this. I remember that the most weirdly intimidating factor when I started this game was realizing that there were more than 400 achievements. Undertale: One of the biggest recent indie darlings. I did my duty and bought it but I just couldn’t get into it. Space Run: One of my most played tower defense-type games. I also classify this game as ‘completed’ since I have earned 100% of the associated Steam achievements, a personal first. SimCity 4: I wanted to try a proper city building game and dusted off this disk for my WinXP machine. I couldn’t get into it. Defense Grid: The Awakening: I played this tower defense game a lot prior to 2016. I thought I had mostly finished it but then I booted it up during 2016 and realized that there were still numerous missions I hadn’t finished (when you buy the full bundle, this game comes with a huge pile of DLC). This is now the most played game in my Steam library and I’ll likely keep revisiting this from time to time as I shoot for all the achievements. Defense Grid 2: I 100%’d this game, at least for all the single-player achievements. It’s a much shorter experience than the original game since there isn’t any additional DLC. This sequel provides a much more streamlined experience than the first game. Game of Thrones Telltale game: Being a fan of the HBO show, and after playing through Telltale’s The Wolf Among Us, this seemed like a good candidate to play. It’s mostly like watching a Game of Thrones spin-off TV series, and that’s okay. Cities: Skylines: I played this briefly during a free weekend on Steam early in the year. I bought the game much later in the year when it was on sale as I feel determined to try to enjoy this type of simulation game for some reason. Keep Talking and Nobody Explodes (Android with Samsung Gear VR): Ah, 2016– the year of virtual reality! I got a Samsung Galaxy S6 Edge+ phone early in the year and then learned about the Samsung Gear VR. So I took the $100 plunge for the headgear. I quickly realized that VR isn’t for me. However, this is one highlight of all the VR stuff I have tried. Shiftlings: Fun action-puzzler game that I played briefly and would like to get back to sometime. Dungelot (Android): I installed my favorite time-waster game on my new Android phone. I can’t let myself play it too much since a single session of this rogue-like can stretch over hours. Crystal Defenders (Android): This was my second tower defense game after Plants vs. Zombies and I still enjoy it. Transformers: Devastation: I was excited by the look of this game for the same reason I was enthused for Robotech: Battlecry back in 2002: the game’s art style looks exactly like the source cartoon I grew up with. Regrettably, the game play just didn’t grab me. Sky Force Anniversary: I really enjoy this modernized shmup and the soundtrack is especially exceptional. Like Ultra Street Fighter IV, I have played it many times, but never too long in one sitting. Hard Reset: This Steam code came with a new video card I bought this past year. This was a bit weird because, usually, such promo deals feature games that actually showcase the capability of the GPU. This FPS has bare minimum graphical requirements which basically amount to a card supporting the unified shading model. Anyway, the game itself is a cyberpunk-themed FPS. I tried really hard to get into it, but alas. It proved I’m no good at FPS games since I couldn’t even get past the 3rd or 4th “area” (depending on how areas are defined). Kingdom Rush: Another tower defense game I have sunk absurd hours into. I have yet to 100% it (one day!). Kingdom Rush Frontiers: I guess Steam assessed that I played the first game so much that I would appreciate a coupon for the sequel upon release. I didn’t even know the release was impending. But they calculated correctly because I exercised the coupon and went right to work on this game. I have 100%’d the game several times– because the creators keep releasing new updates. It’s all good. Castle of Illusion: I caught this upgraded Mickey Mouse game from the Genesis era on Steam sale and it’s a delightful little action game. It also vanished from Steam almost immediately after I bought it, but I still get to keep my copy. Star Wars: Republic Commando (Xbox): I was just testing that the Xbox still works. I’m no good at FPS games and this game only reinforced that fact. Marvel Nemesis: Rise of the Imperfects (Xbox): This accidentally came with my most recent Xbox console purchase. It’s a 1v1 fighting game that provided a lot of entertainment among my group. It has good old Marvel mainstays like Spider-Man and Daredevil, but it also has a series of “Imperfects”– superpowered beings for which EA apparently owns the exclusive IP rights. So don’t look for them anywhere else. Project Gotham Racing (Xbox): Racing game. Didn’t make an impact. Sega GT 2002 (Xbox): Another racing game. Again, no impact. Robotech Invasion (Xbox): I’ve been wanting to try this game for a long time thanks to being a fan of Robotech from back in the day. I was disappointed to find a rather unremarkable FPS. Street Fighter Anniversary (Xbox): We were having so much fun with the Rise of the Imperfects that I obtained this collection which includes SF2 and SF3. Hydro Thunder (Xbox/Midway Treasures 3): Fun arcade-emulated racing game on the Xbox. S.T.U.N. Runner (Xbox/Midway Treasures 3): I loved this game in the arcade. However, they completely messed up this release. The emulated version of this game runs entirely too quickly. I don’t know how they overlooked this. Girls Like Robots: Nice little puzzle game. Not The Robots: Very odd little game which feeds into a gamer’s obsession for collecting stuff. Rush 2049 (Xbox/Midway Treasures 3): Another game off this racing arcade game collection (there are 8 total on the disc). Stolen (Xbox): Stealth action game from 2005. I would like to get back to this game in the future. Test Drive (Xbox): Another racing game. No impact again. Titan Attacks! : Bundled along with Revenge of the Titans, this is a fairly brazen Space Invaders clone… but darned if I didn’t play it nearly 10 hours while collecting most of the achievements. I’ve never enjoyed a Space Invaders variant so much and this made up for the Revenge of the Titans disappointment. Droid Assault: Part of the Ultrabundle, this is sort of an overhead adventure/exploration game. I didn’t get into it. Ultratron: Part of the Ultrabundle, it’s a Robotron 2084 clone. Supercharged Robot Vulkaiser: Action game with a charming aesthetic of pretending to be a 1970s Japanese Anime translated to English. Steam says I played it for only 8 minutes but it felt like longer. I guess I’m saying I didn’t get into it. Mortal Kombat Armageddon (Xbox): Fighting games were the order of the day at gatherings, so I procured this title that has 60+ fighters. It just doesn’t get boring. Zombo Buster Rising: An odd little tower defense. It’s not without its charm. McDroid: Another tower defense game. Nice cel-shaded art style but I couldn’t get past the first level. Dungeon Warfare: Here we go! This tower defense grabbed me in a major way and I have sunk nearly 60 hours into it, grabbing most of the achievements. Such a simple art style, but so much fun. Lara Croft GO: I always wanted to try this isometric puzzle game on mobile but now I can play it on Steam. Syder Arcade: This is another action standby that I like to play for a few minutes in a session. But I can’t sustain the shmup action for very long. Shovel Knight: Still trying to work through this beautiful retro-style darling. Ball of Wonder: A Breakout/Arkanoid clone and it’s hard to go wrong with that. Alien Robot Machines: Yet another tower defense game. I’m enjoying this quite a bit, but it has its flaws (namely, the upgrade tree is difficult to manage). Super Win The Game: This is amazing. The apes the style of classic NES games, drawing the most influence (in my perception) from Zelda II: The Adventure of Link. The CRT filter that the game uses is nothing short of remarkable. Creeper World III: Arc Eternal: My final tower defense game of the year. I haven’t gotten too far into it, but it seems like an interesting twist on the concept. All right. So I guess a good gaming resolution for 2017 would be to branch out a bit from the tower defense genre (8 out of my top 10 most-played games on Steam fall under TD in some manner). I already have hundreds of games stockpiled. But that’s not good enough, oh goodness, no. I had to go and by 433,000 new games. Would you believe these new acquisitions? First, there’s a CD-ROM (it’s actually 3) that alleges to contain 100,000 games. 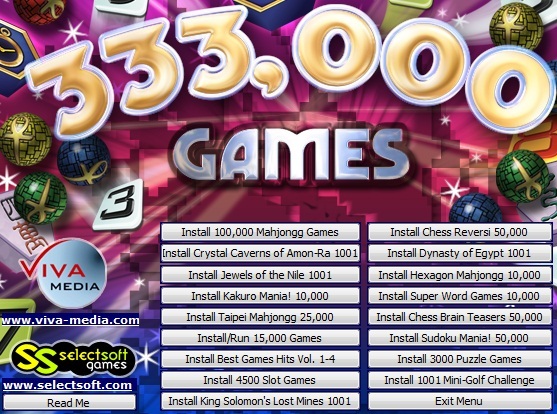 Not satisfied with that, the very same companies (jewel cases both list Viva Media and Selectsoft) released a DVD-ROM claiming 333,000 games. So what’s the wager? Do you really think the games contain so many games? Or do you think it’s another situation like the 1997-in-1 game handheld unit that actually contained 14 unique games but hundreds of “levels” for each? What does Occam’s Razor have to say about the situation? Yeah, there is just a handful of games with thousands of uninspired “levels” for each. I tried a few of the games on the first (of 3) CD-ROMs covering the 100,000 games title but most of them are of a quality level that would have been embarrassing 15 years ago (the 100,000 games box lists a copyright of 2008; the 333,000 games DVD lists 2009). Thankfully, someone has already entered the 333,000 games DVD into MobyGames, absolving me of the responsibility. 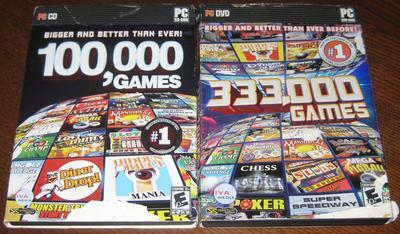 In a way, I felt relieved to learn that there weren’t 333,000 unique games on the DVD. I have my doubts that so many unique games have yet to exist in the history of computer gaming. Still, confronted with so many choices, I feel absolutely daunted. I wouldn’t even know where to begin to play a game. Similarly, I have over 180 game demos downloaded onto my PlayStation 3; in those rare situations that I feel inspired to sit down and try a game, I can’t decide what to play. I suspect this is a familiar situation that leads to “500 channels and nothing’s on” sort of mentality. Captain Novolin was a notorious SNES title about a diabetic superhero who fought off sugary snacks. If Seanbaby’s review of the game is to be believed, that’s about all there was to this (probably) well-meaning game that only wanted to educate children about certain health problems but has nonetheless gone down in video game history as a silly joke. 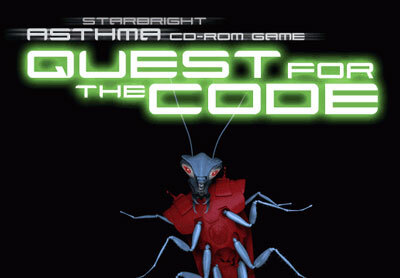 On that note, I present Starbright’s Quest for the Code, a star-studded video game assembled to teach kids about asthma. Actually, the game isn’t geared towards kids in general but rather is targeted specifically towards kids suffering from asthma. I have no idea if this game was ever marketed or intended to turn any kind of profit. The still shrink-wrapped copy I procured for a dollar in a spent shop stipulated that it was not to be sold but should be freely given to an asthmatic child. Here’s the story: Diane Sawyer — lending her newscasting talent to this charitable cause — breaks a story about a giant machine that has just landed in town and is threatening to release all manner of asthma triggers. The machine is run by one Mucus Airgon, someone who apparently really has it in for asthmatics and has a gang of 7 henchvillains creatively named “The Evil Seven”. So you know that 7 levels are going to be involved somehow. I should clarify at this point that the main thrust of the game is to educate asthmatic children how to live with asthma and that it does not have to be debilitating. It seems that Airgon’s grand plan is simply to demoralize asthmatic children. The gap between that and the “Profit! !” step remains a smidge hazy but I’m certain I have seen stranger premises in other games during this Gaming Pathology project. The title of the game refers to the acquisition of 7 pieces of a code which will be used to destroy Airgon’s asthma-triggering machine. Or some such. Cuba Gooding, Jr. plays the guide, Cyrus and shows up, Matrix-style (as in, he mysteriously contacts you through your computer). He leads you first through a lung simulator to teach you how the human respiratory system operates and how asthma and its triggers act upon the system. I had a sinking feeling about the game play aspect of the proceedings as soon as I saw the first activity — cleaning up snot in the nose. Now, I’ve put up with a lot of outlandishly silly game play concepts for this blog (measuring and cutting drapes continues to stand out in my mind). But how creatively bankrupt does your premise need to be before cleaning up snot becomes a viable game play mechanic? I hate to dwell too much on this point since this is most likely a kind-hearted charity effort. The game has 3 main types of game play, at least during the levels that I played, and not counting the cursory snot cleanup. The first type involves the player dragging different types of asthma triggers over areas of a room where that type of trigger can occur. The game then challenges the player about a good course of action for mitigating that trigger. This is seen above. 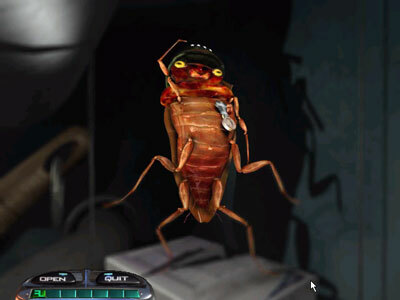 The second type of game play, encountered after the player has finished auditing a room, is a simple point and click pixel hunt to determine the location of a member of the Evil Seven. 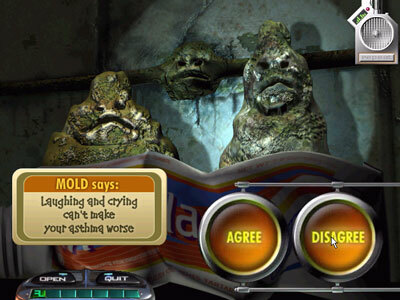 After locating the dreaded villain, there is a trivia round where the player must answer a number of asthma-related trivia questions correctly in order to clear the level. There is at least one other type of game play on offer– after clearing the first 2 levels, the player gets to shoot mucus in an Asteroids clone. There is likely to be another minigame after the next 4 villains, based on the way the villains are grouped in the stage select screen. I would enjoy learning more about how this game was produced. The credits are quite extensive and a lot of work and talent went into it. Maybe one day I’ll put together a highlight reel of some of the villains from this largely Smacker-based game. 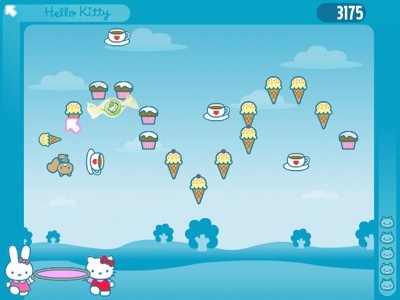 Oh look, another Hello Kitty video game that isn’t in MobyGames yet. Dang it. All right, let’s just get this over with. Really, I shouldn’t have a foul attitude about this. 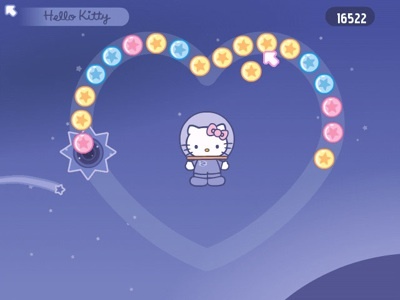 My last outing with a Hello Kitty game — Hello Kitty Dream Carnival — was actually quite the delightful romp. 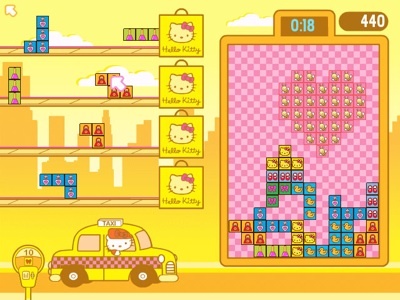 Hello Kitty Bubblegum Girlfriends is more of the same — colorful, simple, and actually very fun. I’m impressed that, even though Dream Carnival and Bubblegum Girlfriends were developed by different houses, they both carry a very consistent style. This probably goes to show that Sanrio exercises tight control over its licensees. This game, like the other one, is a series of 8 rather well-engineered minigames. Here are the ones I found the most interesting. Hello Kitty and her bunny friend use a trampoline to keep the squirrel in play grabbing ice cream cones and cupcakes. I hope the squirrel at least gets a cut of the spoils for her role. 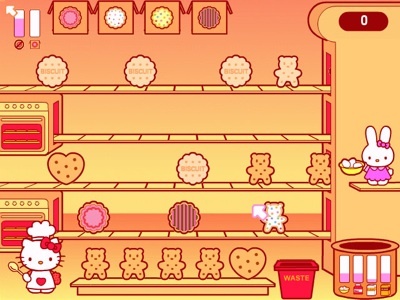 Place cookies from the bottom shelf onto the light outlines moving on the conveyor belts (first and third from the top). Those cookies come out baked and decorated on the second and fourth belts where they must be manually picked up and placed into the appropriate boxes on top before they reach the end of the belt. You’re going through a lot of ingredients but Hello Kitty’s friends have many more for you to use. You just need to click on them when they arrive with the ingredients and they will cheerfully drop them into the cauldron. Interesting tech trivia: The credits for the game give a shout out to the Lua programming language, implying that it must be used in the game somehow. I’ve seen Operation and Clue adaptations in this Gaming Pathology project and now I come to another board game adaptation — Candy Land. I wonder if this will be a direct adaptation (like Clue) or an “inspired by” type of adaptation (like Operation). The answer turns out to be a mixture– it is a direct adaptation of the original Candy Land board game but with 8 minigames/side activities to keep things interesting. 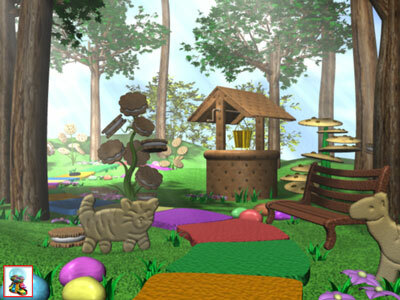 As for the primary board game, the developers went through the trouble of lovingly modeling the beautiful Candy Landscape in 3D and rendering still shots that encompass every single space in the game. When moving from one space to the next, the player is treated to a somewhat clunky transition between these shots. With a little more computing horsepower, this could be a great FPS setting or some kind of 3D animated game. Now here are some of the more unusual items that struck me about the side activities. In the Gingerbread Plum Forest, the player meets Plumpy who cheerfully describes himself as the last of the Plumpa Trolls. You would think that being the last of his race would be cause for despair, but not so. 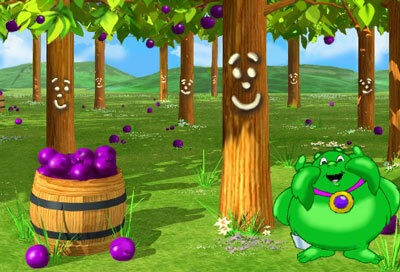 Plumpy wants nothing more than for you to tickle him into surrendering plums for a pie. Maybe that’s his way of coping with the trauma and depression. 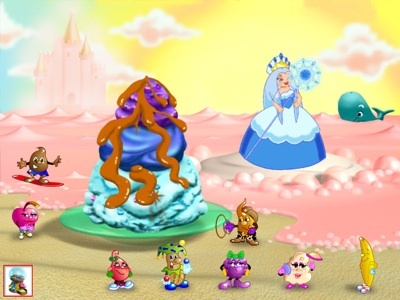 Next to the Ice Cream Sea, the player has the opportunity to customize a giant sundae by clicking through the various layers in order to rotate through colors/flavors. Then, clicking on the creatures surrounding the sundae allows for decorating. Afterwards, ask the fairy to set the sundae adrift on the Ice Cream Sea where it is promptly devoured by a whale. It seems that eating it on shore would have been a positive idea. Then again, maybe it’s better to let the whale have at it considering that the sundae was decorated with bodily excretions from anthropomorphic confections and foodstuffs. 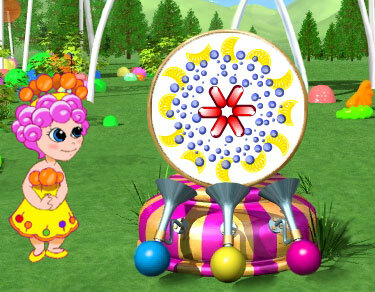 The Lollipop Woods afford the player the opportunity to decorate giant lollipop trees using a special decorating machine. It turns out that lollipop decoration is performed in a CMYK colorspace. 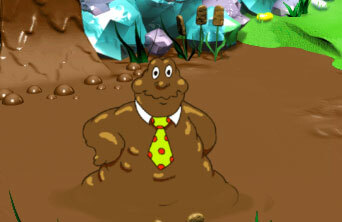 This is Gloppy, the proprietor of the Molasses Swamp. There are no activities in the swamp except to interact with a few surroundings. Golem is a real time strategy (RTS) game developed by a Polish house named Longsoft (which isn’t in the database yet, which likely means that most of the developers listed in the credits are not in yet, which means I need to break out the Polish diacritics for copy and pasting). I have had limited success with RTS games so far but why should I let that stop me? The manual establishes that there was an unspecified “cataclysm” that thrust the earth into chaos. 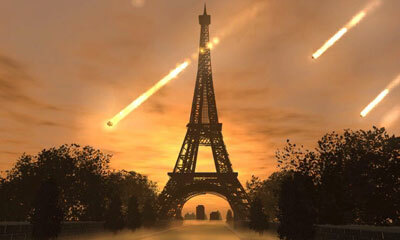 The very well-produced opening FMV indicates that the cataclysm came in the form of radioactive meteors taking down the Statue of Liberty, the Eiffel Tower, and the Sydney Opera House. The upshot is that the destruction of civilization in the ensuing tidal waves, combined with mutations, or lack thereof, caused the survivors to form 3 separate factions. The manual actually had a lot more detail. But am I the only one who gets bored extremely quickly when faced with a large volume of background story, particularly for sci-fi or fantasy games? The game has to do with building facilities that harvest natural resources and then putting those resources to work building machines of war with which to attack the other factions. That’s the general impression I got from the manual. I’m pretty sure that this is the thrust of the famed Command & Conquer games, which I have never actually played (though I have collected several of the titles for the purposes of studying their multimedia). I gave the tutorial a whirl but when the game cut me loose, I was at a total loss. I came to the sad realization that today will not be the day that I learn to start caring about RTS games. But that’s okay because I think I collected enough data for a reasonable MobyGames entry. I just wish I could figure out a way to rip the intro FMV, which appears to be encoded in Indeo 5, and upload it for posterity.